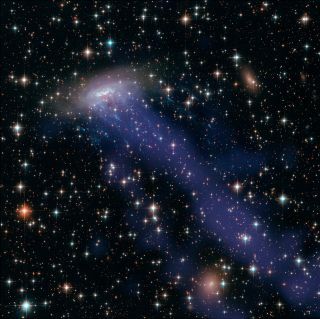 This image of the galaxy ESO 137-001 is a combination of images from the Hubble Space Telescope and Chandra X-ray Observatory showing the galaxy being ripped to shreds (blue streaks) as it passes through a galaxy cluster. NASA's Hubble Space Telescope has once again shown itself to be a crack investigator, recently capturing a distant spiral galaxy in the process of spilling its cosmic guts. The new Hubble images reveal the deadly passage of ESO 137-001 through a region of gas inside of a cluster of galaxies, with opposing forces causing the spiral to leave a large portion of its innards trailing behind. "This cluster is violently ripping the spiral’s entrails out into space, leaving bright blue streaks as telltale clues to this cosmic crime," Hubble telescope officials wrote in an image description. Scientists describe the galaxy mayhem in a video of galaxy ESO 137-001 featuring the Hubble views. This Hubble Space Telescope image shows the spiral galaxy ESO 137-001, framed against a bright background as it moves through the heart of galaxy cluster Abell 3627. The bright blue streaks (seen in ultraviolet light) are wispy streams of gas being torn away from the galaxy, scientists say. Located in the southern triangle, ESO 137-001 is a spiral galaxy traveling at nearly 4.5 million mph (7.2 million km/h) through the Norma cluster. As it plows its way through the superheated gas around it, ESO 137-001 experiences a process known as ram pressure stripping, which is akin to the drag swimmers feel as they pass through the water. Just as a fast-moving swimmer and a too-loose suit can result in disaster at the beach, ram pressure stripping can leave its mark on galaxies. Though gravity keeps the galaxy's stars contained, the motion strips away much of the its interior gas, shown in the intense blue streaks that shine brightly in ultraviolet light. Although the stripped gas then becomes a center of star formation, the galaxy itself will suffer; very little is left behind to fuel the future birth of stars within the spiral. Gas isn't the only element taken from the fast-moving galaxy. Though ESO 137-001 holds on to most of its dust, some is captured by the gas of the cluster, showing its displacement in brown streaks. The secrets of the distant spiral have been particularly challenging to probe, as ESO 137-001 lies close to the plane of the Milky Way galaxy and is partially obscured by the dust of our own galaxy. Hubble's Wide Field Camera 3 (WFC3) proved an excellent sleuth, capable of peering through the region. Images of stripped galaxies help scientists gain a better understanding of galactic evolution, particularly the future of bodies pressing through the heart of a galactic cluster. The fate of ESO 137-001 is particularly interesting since its parent cluster resides near the center of the Great Attractor, a massive region of space that pulls entire galaxy clusters. Only 200 million light-years away, the Milky Way won't escape its reach; our galaxy and its parent cluster are both being pulled slowly toward this dense region.